This year, the top prize at the National Geo-Bee went to an eighth-grader from the East Bay city of San Ramon. SAN RAMON, Calif. (KGO) -- This year, the top prize at the National Geo-Bee went to an eighth-grader from the East Bay city of San Ramon. His name is Venkat Ranjan, and he surrounds himself with maps. He likes to say he builds on the knowledge that geography offers him. It all started with a talking globe that his parents gave him as a child. That sparked an interest in learning everything about every country. "I read the National Geographic magazine and also keep up with news. If you keep up with the news, you can learn about new places. You have to take it step by step," said a smiling Venkat. 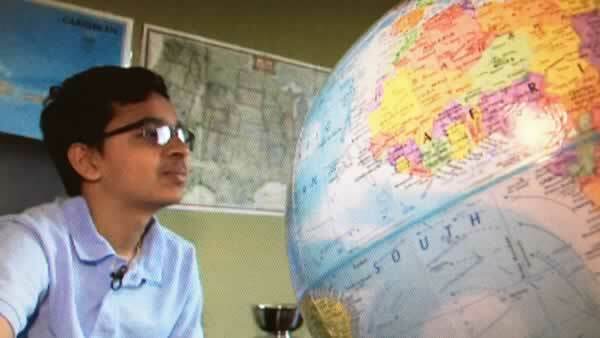 VIDEO: Do you have what it takes to be a Geography Bee champ? For example, take Australia -- knowing just the states and capitals won't cut it. "You need to know all the peninsulas, towns, mountains ranges, gulfs, straits," he explained. "Sometimes, we play geography games and he's always like, 'oh my God, you don't know that? I don't want to play with you guys any more.' It's so easy for him and it's funny he laughs a lot when we make mistakes," said his proud mother, Chinmayee Raman. Venkat made no mistakes last Wednesday during the National Geo-Bee Championship. He answered this question correctly: "Lebanon has a similar population to what South American country? " Paraguay was the right answer, earning him a $50,000 prize and a trip for two to the Galapagos islands. Overnight, he became a sensation at his school, Windemere Ranch Middle School in San Ramon. So what will he do with all this vast knowledge? "My dream job would be an engineer at NASA, he said. Perhaps some day he will work for NASA, but for now it's all about learning what we have here on Earth. After that, the sky is the limit. Next step -- mapping the universe.